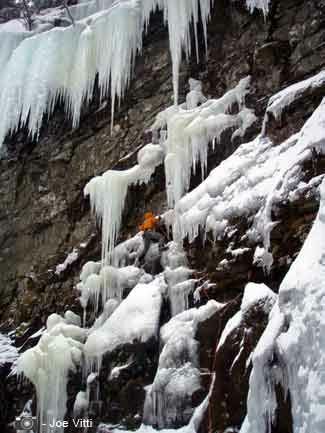 The Catskills offer incredible ice climbing that is only 2 hours north of New York City. From lower-angles flows of ice, to overhanging walls, to multi-pitch cascading waterfalls, the Catskills have climbing for all levels of ice climbers. 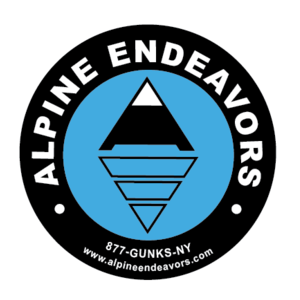 We offer professional instruction and guided climbing daily from December through March. Kaaterskill Clove - located on RT 23A from Palenville to Haines Falls, it includes all the areas located at: Moore's Bridge; the ravines (Hilyer, Viola, Wild Cat, and Buttermilk Falls), Asbestos Park, and Kaaterskill Falls. Platte Clove - located on County RT 16, it includes the Platte Clove water falls (Platte Kill, Bridal Veil, and Japanese Falls), the Devil's Kitchen, and the Black Chasm. Stoney Clove - located on RT 214 near Notch Lake, it includes all routes on the east and west side of Stoney Clove. Deep Notch - located on RT 42 near the crest of the hill, it includes all routes on the east and west side of Deep Notch.